Over 125 people gathered at the Holocaust Memorial Center to hear the testimony of two Syrian Muslim refugees now living in Metro Detroit and to participate in small group text study; photo courtesy The Well. Since formally launching on June 1st, The Well, Metro Detroit’s new pluralistic Jewish community-building, education and spirituality initiative has had tremendous success in its outreach and relationship-building efforts in Metro Detroit and beyond. The question that we’re exploring the answer to is simple: in a Jewish community that has myriad successful Orthodox outreach organizations, what does effective (and replicable) liberal Jewish outreach look like? Due to a visionary four-year pilot gift by a single donor and the backing of Temple Israel, the largest Reform synagogue in the country, The Well was born with a belief that Jewish community, ethics, values and spirituality can and should be directly applicable to our lives, and should drive us to positively impact the world around us. Our programming in our first seven months has been both diverse and successful. For example, we launched a 30-day introspection-centric social media campaign and invited folks around the world to participate during the month leading up to Rosh Hashanah. We fostered partnerships with Hillel International, Bible Raps and The Pardes Institute for Jewish Studies, and had an amazing group of participants posting each day for the month, from Detroit to Jerusalem, from Johannesburg to Vancouver, and everywhere in between. 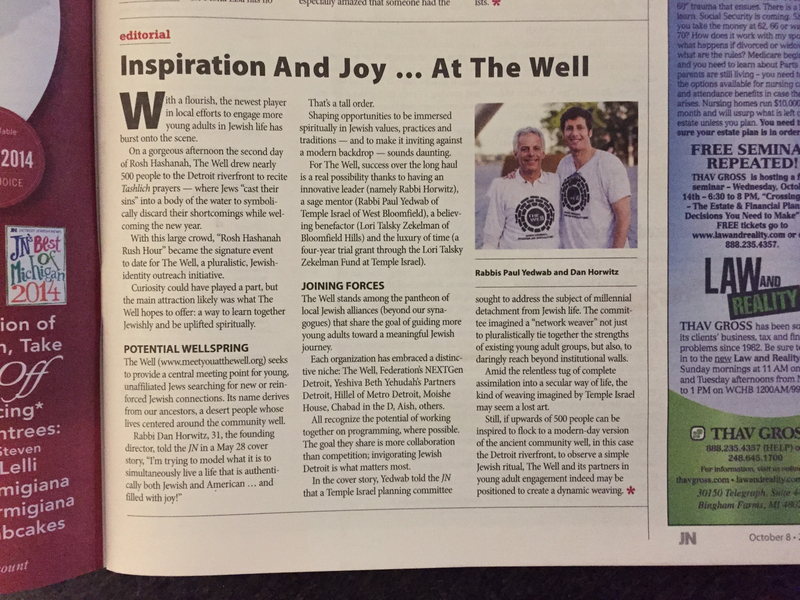 It was an article in eJewishPhilanthropy that really helped us spread the word about the opportunity. Plans are underway to expand the project’s reach in 2016, with the planning committee already including young adults living in Los Angeles, San Diego, Philadelphia, Chicago and San Francisco, in addition to Detroit! On the 2nd day of Rosh Hashanah, we had almost 500 people – overwhelmingly young adults ages 22-35 – join us in the heart of the City of Detroit for a Rosh Hashanah celebration and to participate in the ritual of Tashlich in the Detroit River. We fostered partnerships with 7 other local Jewish nonprofits, put together and empowered a host committee of 20 young adults (the majority of whom are unaffiliated) and pulled off an event that folks found spiritual, rooted and fun! We received wonderful media coverage – both secular and Jewish – for the event. During Chanukah, in addition to an interfaith couples ugly sweater party and two other dinners, we made news by hosting a Jewish learning event at the local Holocaust memorial museum, where over 125 people came to participate in text-study on the issue of what the Jewish tradition has to say about refugees. Welcomed at the event were two recently resettled Syrian Muslim refugees living in Metro Detroit who shared their stories with those present. Attendees immersed themselves in a text packet that included selections from Emma Lazarus, Tony Kushner, Torah, Midrash, Talmud, Nechama Leibowitz, Rabbi Jonathan Sacks, and contemporary Syrian rap lyrics. We brought 6 different partner organizations on board, put together a planning committee of 8 young adults, and empowered an additional 10 young adults to volunteer as text study facilitators working the room. The entire event, from conception to execution, was planned in only 2 weeks. We’ve been having at least two “Big Idea Breakfasts” each month, where folks of all ages / backgrounds come together at the best breakfast spots in town to discuss macro-level issues with others before heading to work. While morning minyan isn’t for everyone, as a result of the practice, early morning Jewish camaraderie has been a staple of our people for over a thousand years. So, why not find a way to continue enjoying it? From conversations about etiquette, to our changing economy and AirBNB, participants ranging in ages from 21-80 have enjoyed coming together for these big picture discussions about life and our world. Inter-generational learning is truly a special thing. In just 7 months, our programming has touched well over 750 unique individuals with many repeat attendees who are excited about what we’re building. In addition to some of the highlighted programs above, we’ve hosted family Shabbat picnics, Tot Shabbat services, a Torah and Tailgate in Ann Arbor, a Jewish music jam session, a dress-in-white garden party for Tu B’Av (the Jewish day of love), and 15 Shabbat and holiday meals. Our Facebook page has almost 950 Likes with zero paid advertising to garner them. I have had 90 one-on-one coffees with individuals, the overwhelming majority of whom have since attended at least one of our programs. The Detroit Jewish News highlighted our work in the community with an incredible editorial, in addition to generally receiving incredible press. We have partnered on our programs with over 15 local and national organizations. Most importantly: over 50 young adults have taken on leadership roles in creating these experiences for others. So, how do we continue our momentum into 2016? Well, we have 15 young families signed up (and paying $150 each) for a 5-part “Senses of Jewish Detroit” Family Education experience launching in January and meeting once each month at a cool Detroit venue to learn and explore. Half are affiliated with a synagogue and half are not, as part of our “network weaving” efforts to connect and help build relationships between those who are not affiliated and those who are. We’re launching three lay-led “shared interest groups” in January, including a women’s Rosh Chodesh group, a men’s whiskey appreciator group, and a couples Giving Circle and Dinner Club (which already has 6 couples signed up) led by one of our board members who was recently trained by Amplifier Giving. Thanks to a generous grant from a New York-based foundation, we’re going to be building a monthly text-study learning experience taking place at cool venues all over town, focusing on topics relevant to contemporary living, and featuring incredible educators/facilitators from all over the country. We’re heading up to camp in February for a Shabbat retreat at the Butzel Conference Center @ Camp Tamarack. Immersive experiences are by far the best way to build robust community! We’re planning a raucous Purim feast and celebration in March, and an incredible out-of-the-box 2nd night Passover Seder at the hip movie theater in town’s banquet room, followed by a late night showing of a Passover-themed movie for those who enjoyed 2nd night Seder with their families. Most importantly, we’re continuing to encourage participant-driven programming. So – what have we learned in our first 7 months? First: Young adults are craving the opportunity to have an active role in shaping experiences for themselves and others. Make it a point to ask them to be involved! There’s no question that there are times it takes much more work and time to meaningfully engage a host committee of young adults than to simply plan the program yourself – but if your goal is to engage and connect, it must be done. Second: Don’t waste your time recruiting young adults to events / membership – empower young adults to have an ownership stake in your organization or program, and then let them reach out to their networks! The reason organizations like Moishe House are so successful is that all of the programs are participant-created and participant-driven. When people are excited about what they’re doing, they’ll reach out to their friends, who will inevitably support them by attending/donating/etc. We’ve certainly found this to be the case. Third: Young adults are interested in having a personal relationship with a rabbi. The caveat often is that the rabbi must speak their language, must not make them feel judged based on their life choices (e.g. who they love, what they eat, which holidays they observe), and must eliminate bureaucracy (making an appointment to see the rabbi through her/his administrative assistant isn’t the same as dropping a text or Facebook message with a question). Fourth: There is no need to ever use the word “free” when promoting events. Young adults are totally open to being asked to have “skin in the game” even if it’s not in the form of a financial contribution. There are many events we put on where there is “no cost to attend due to the generosity of donors,” but participants are still asked to bring multiple bottles of wine, potluck dishes, gifts to be donated to local shelters, etc. Frankly, free is false, and is a disservice to our community. We have never used that word in advertising any of our programs, and our attendance has not suffered as a result. Finally: While everything we do in outreach and engagement work indeed is all about personal relationships (as preached correctly by my teacher Dr. Ron Wolfson), there are only so many hours in the day allowing for one-on-one or small group interactions. There is a need, as well as a developable skill, to create larger-scale experiences where those present feel like they’ve personally connected with you as the leader and have grown as a person as a result of connecting with the community – even if they’re one of hundreds assembled. Finding ways to empower others to help you create such opportunities is what can help transform a modest sized community into a movement. A Mazel Tov to Rabbi Horwitz and to Temple Israel for their initiative in creating The Well. I look forward to hearing great things about its successes!